The rug is exactly what I expected! Deftinely reccomend. 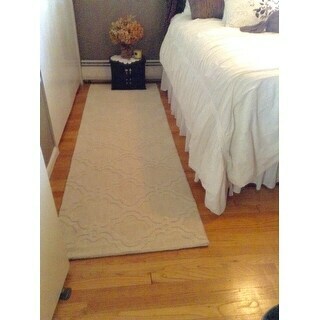 Option: Grey - 8'6" x 11'6"
I love this rug, its great quality, elegant, grounds the space and makes this area welcoming. I've found this rug does not shed as much as I thought it might. I couldn't have chosen a more perfect rug to centre this space, the colour is pretty accurate. It is not a flimsy rug and looks expensive. My advice is if in doubt go bigger. 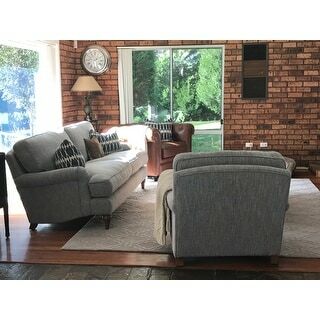 My friends love this rug as well, the colour goes well with my warm timber floors. As you can see from my pic I have a grey lounge and a warm leather chair, it complements both, I cannot be happier. Thank You overstock!! I have added 3 photos in different lights, one shows the morning light, one midday and one shows late afternoon. Hope this helps. 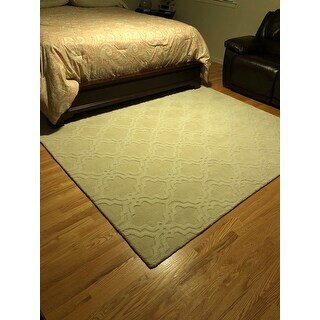 I purchased this rug for my guest bedroom. It is definitely even more luxurious and well made than the photos shown in the description. E weave is dense and the rug is nice and thick..but not so thick that a door won't close over it! The color is perfect and the pattern is subtle yet definitely adds to the beauty! 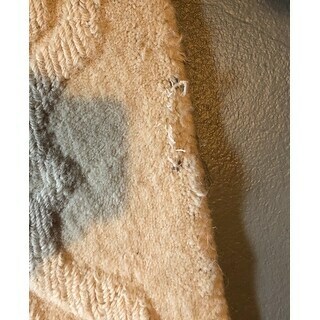 I can honestly say that I have paid more than twice as much for other rugs and the quality was not half as good. 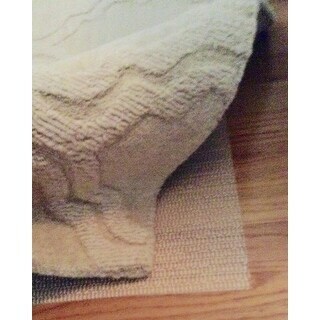 I did place the Nourison non-slip rug pad underneath to keep it from sliding on the hardwood floor. I would definitely recommend this rug! 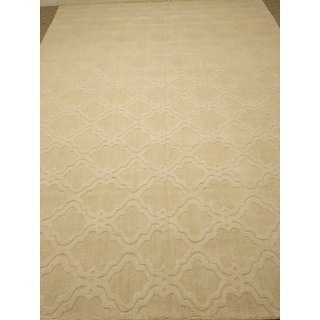 Option: Cream - 8'6" x 11'6"
I really liked this wool area rug! It is exactly as pictured...that perfect cream color! I would definitely order this again and highly recommend! Option: Grey - 9'6" x 13'6"
Granted this is wool, so it's scratchy by nature, however it's not as thick and plush looking in person. It's a nice rug, but it's not as cozy and soft as I'd hoped it'd be based on the photos and description. Very pretty color! Nice plush rug with a pleasing color. I like how it lay flat immediately. This was a bigger size than I needed so will exchange for a smaller rug. I think this is a great rug! I purchased this for a large guest bedroom (queen bed). It’s a nice modern touch for those noncommittal on a patterned/multicolor rug (me). 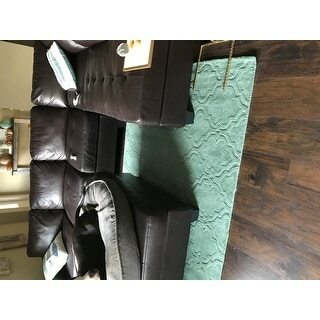 The rug is very true to the color advertised. I’ve owned for approximately two months. It took about a week for the corners to lay down. I’ve vacuumed several times and have found shedding to be minimal. Of note, it is being used in a low traffic area. Option: Moss - 7'6" x 9'6"
Although I really liked the color, texture and style of this rug, I ultimately chose a different one. 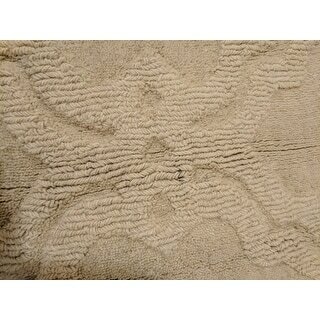 This rug was high quality and reasonably priced. I would recommend it to anyone. Color and design just as shown! 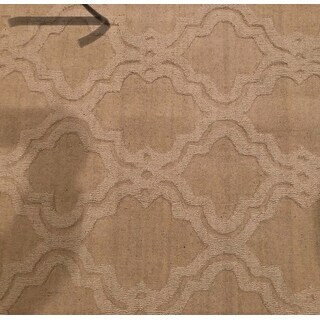 Love this rug! So I received this rug and I love it . It looks and feels great . It’s wool and warm and beautiful. I’m so glad I made this rug choice . Great items to fill your home with . This rug is exactly what my room needed. It needs a carpet pad to give it a little more softness, but the color and design are just right. Its wool and it sheds, a little. I ordered the gray and it is not the same gray as in the pics. I was expecting a lighter gray but instead received a dark almost purple rug. I'm very disappointed, but this is my second time ordering and getting something else than what is pictured. Too many ch hassle to send back again. I was really excited to get this rug. But when I opened it, it looked dirty, like it had already been used and returned. There are quite a few places that were coming undone. I'm scared that if a vacuum it, the whole thing will come apart. This will be returned depending on how difficult the process is. Beautiful rug! Can not believe how reasonably priced this rug was for the quality. It definitely sheds but it’s in my formal living room which doesn’t get much traffic so it doesn’t really bother me. Perfect cream color too! 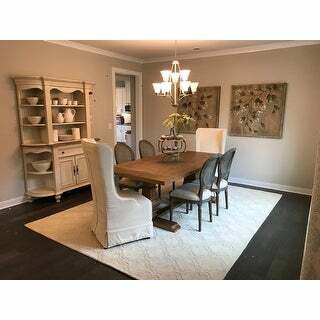 Option: Cream - 7'6" x 9'6"
Love the rug! The design is exquisite. I vacuum it every couple days to help reduce shedding. I would definitely buy this rug again. Terrible wear and tear immediately, horribly shedding and discolored so easily. Going on year two and I just replaced it! Not worth it. This rug is beautiful. Soft and well made. Good quality. I got moss which is a green blue color but more green than blue. Just a great accent color. Great price. Lays flat. No bad smell. Love it! 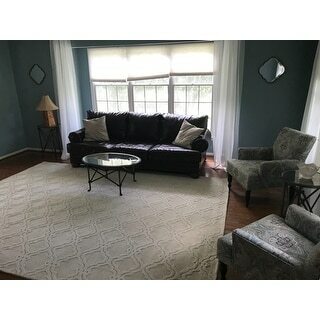 Although the color didn’t work out for the room I painted I wish it would have because now my mother owns this beautiful rug. It has great 3D effect to it. Very sleek. This rug is terrible. Purchased in November 2018 for a low traffic area. It sheds and is starting to unravel, leaving little pieces of wool all over the room. It is now my garage rug. Looked good for about a month. Disappointed. I waited a few weeks after receiving this rug before I wrote a review to make sure I was over my excitement of getting it. The color is very accurate compared to the online picture. The rug is soft and since it is secured by the bed, I didn’t put a pad underneath it. There is no smell from the wool. I haven’t noticed much shedding- my floors are a dark brown and show everything. I’m very happy with this rug! We returned this runner, it was cut and bound crookedly on one long side, clearly evident on the floor. Poor quality overall. Return and credit were very smoothly handled. This makes the room look elegant. The light teal blue color is very pale, almost pastel like. 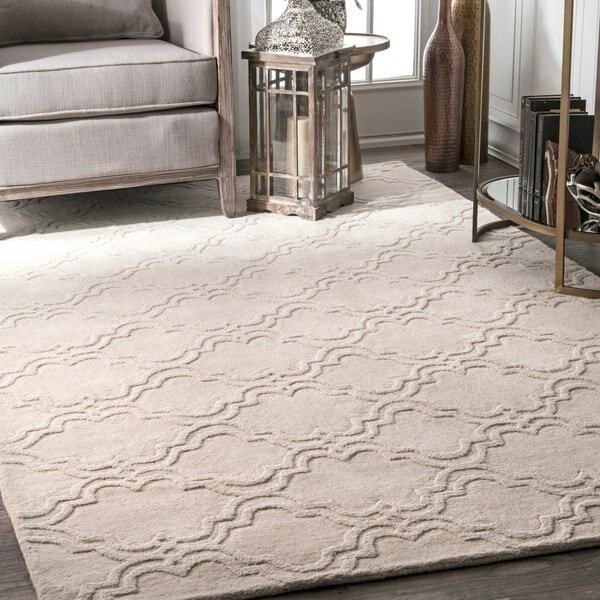 We used it to make a living room feel more luxurious with the thick pile wool underfoot, it lends a really lifted touch! Great rug, just watch out if you have pets, their nails easily pull it. 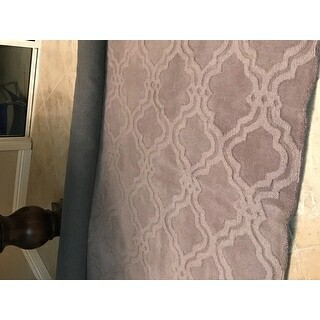 Beautiful rug & excellent customer service! 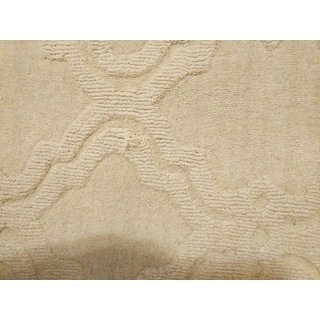 Option: Cream - 9'6" x 13'6"
Beautiful rug if it didn’t have two 2-3 foot sections of discoloration running the entire length of rug. First time ordering on Overstock and likely my last unless they can make it right. Completely disappointed. 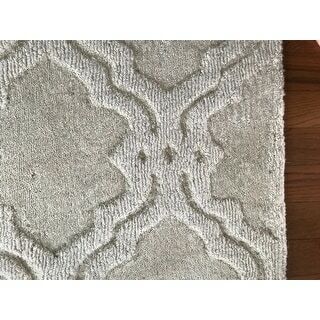 "How to clean this rug?" We recommend vacuuming regularly. New rugs may shed initially. Blot stains immediately. Use professional cleaning for larger spills and stains. "Can you describe the gray? Is it a blue gray or a beige gray?" "Does this rug come in a larger size?" "Does this rug shed like most wool rugs?!? 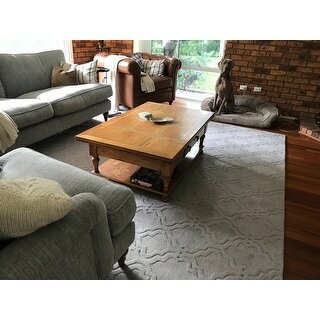 I don’t want to make another wool rug mistake 😬"
A with most rugs, there will be some shedding initially, but that will diminish over time with regular vacuuming. "Is this rug made with loops? We have a cat whose claws get stuck in looped rugs and then it pulls." Not a rug for you. 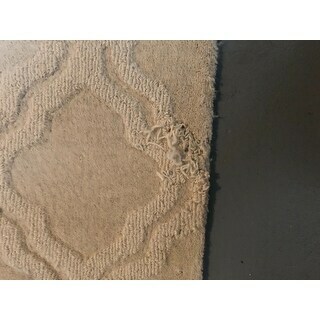 The rug can pull where it's looped. "How soft is this rug? 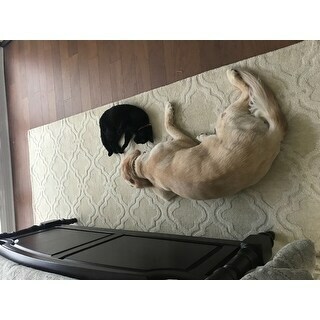 Would it be comfortable to lay on?" It's soft to walk on but it isn't thick and plush. If you put a heavy pad underneath it would be comfortable to lay on. "Has any one purchased this rug? 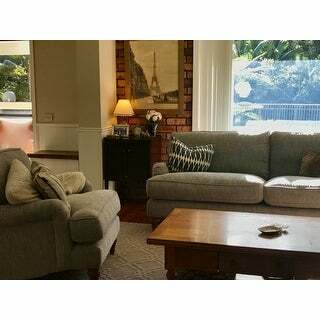 I just painted a light grey living room "on the rock grey" so I'm looking for a large darker grey rug. Room is open and large"
The item has a medium tone grey.